Avengers: Age of Ultron is the next thrilling installment set in the Marvel Universe and is a follow up to the award winning film, Avengers Assemble (2012). At the heart of the story is Iron Man, Tony Stark (Robert Downey Jr) who attempts to start a peacekeeping program based around Artificial Intelligence. However, inevitably things take a turn for the worse when the autonomous technology runs awry and the initial attempt of mediation turns sour. It is up to The Avengers including; Captain America (Chris Evans), Thor (Chris Hemsworth), The Incredible Hulk (Mark Ruffalo), Black Widow (Scarlett Johansson) and adding Hawkeye (Clint Barton) to come to the rescue and save the planet as its population hangs in the balance. Directed by Joss Whedon (Avengers Assemble, Much Ado About Nothing), the film has a star studded ensemble cast with an array of acting talent including Robert Downey Jr (Sherlock Holmes, Iron Man 3 ), Scarlett Johansson (Lucy, Lost in Translation), Chris Evans (Captain America: The Winter Soldier, Avengers Assemble), Chris Hemsworth (Thor: The Dark World, Star Trek), James Spader (The Blacklist, Boston Legal), Tom Hiddleston (Thor: The Dark World, Avengers Assemble) Samuel L. Jackson (Django Unchained, Pulp Fiction) Mark Ruffalo (Avengers Assemble, The Kids are alright) and Jeremy Renner (The Bourne Legacy, The Hurt Locker). 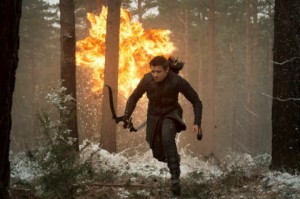 The Marvel Studios production visited Dover Castle in June 2014 for a week to film several action sequences and local runners were involved to ensure a smooth shoot. Dover Castle was used as part of the interior for the Hydra Outpost in Sovokia and you may also be able to spot the entrance to the wartime tunnels that is used a secret entrance. Dover Castle is a stunning medieval castle situated on the White Cliffs of Dover, overlooking the English Channel. Dover Castle is a popular film location having featured in Into the Woods (2015), Poirot “The Clocks” (2009), The Other Boleyn Girl (2008) and Hamlet (1990). Avengers Age of Ultron was released in cinemas on Thursday 23rd April 2015 and is now available on DVD. This entry was posted in Filmed in Kent and tagged Avengers: Age of Ultron film locations, Chris Evans, Chris Hemsworth, Dover Castle, feature film, Robert Downey Jr, Scarlett Johansson. Bookmark the permalink.